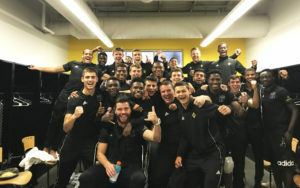 Bethlehem Steel became the first team in the history of the Philadelphia Union system to win a playoff game on Saturday night, and they did so in wild fashion. 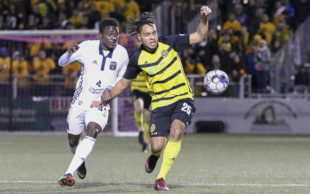 On the road against favorite Pittsburgh Riverhounds, they came back from one-goal deficits in both regulation and extra time to force penalties at 2-2. They then buried eight straight penalties to win the shootout 8-7. As expected, the game was physical throughout. In the first five minutes two Bethlehem 18-year-olds suffered unnoticed and unpenalized elbows to the head, and Bethlehem began to give back punishment in equal measure. Fortunately, neither team ever completely lost its cool, and credit must be given to referee Michael Radchuk for keeping things under control with his slow, deliberate use of time and calm body movement to defuse overheated heads. The first twenty minutes saw Bethlehem high-pressured into playing at a breakneck pace. Their possession game failed because their paces were rushed and inaccurate. They may also have been surprised by Pittsburgh’s 4-2-3-1 shape. At the 25th minute Neco Brett delivered a perfect cross from the left onto Ben Zemanski’s head in the box. The seven-year Portland Timbers veteran headed home past Steel keeper Jake McGuire, who had no chance. Zemanski tried again two minutes later from a corner kick but McGuire came up big keeping the margin to one. Pittsburgh kept Bethlehem pressured, off balance, and playing one-touch soccer. They had outshot Bethlehem 8-2 by halftime, and in the 38th minute the wind increased and the rain began. Michee Ngalina down the right side periodically threatened the ‘Hounds, but Santi Moar was swarmed and did not. Faris showed real signs that he was learning how to play striker physically, North American-style, but absorbed considerable punishment doing so, and acquired a yellow card in the 45th minute as he distributed punishment back. Pittsburgh began the second half with a whirlwind of chances, in part because they had the wind. But in the 55th minute, Steel manager Burke changed the game with his first substitute, bringing Chris Nanco on for Faris. Nanco made a difference. Before his entrance Bethlehem had managed just two shots. By the end they had 10, while Pittsburgh finished with 20. Also Moar began relying less on his dribble and more one one-touch play in combination with others. And Pittsburgh’s pace and pressure began to ease. In the 62nd Drew Skundrich came on for Anthony Fontana who had played well. But the three-time NCAA champion’s maturity, strength and endurance enhanced the difference-making that Nanco, Chambers, and Moar had begun. In the 70th minute Nanco ranged back into the midfield, won a ball, and sent it to the left for Moar who faced only one marker and delivered a cross into the center. The teenage Ngalina — PSP’s reigning player of the week — crashed onto it at close range to even the score. Towards the end of regulation, the Steel were spent. The last several minutes saw Pittsburgh consistently hammering, with five corners and a free kick in the space of seven minutes. But sacrifice, effort and character kept Bethlehem alive. Ben Ofeimu sometimes mis-kicked his clearances, but he read what the situation needed and executed, heading away crosses or interdicting danger before it developed. McGuire made several important collections and saves. Drew Skundrich had a key block in the 89th. And time expired. Steel players celebrate the team’s first-ever playoff win. Bethlehem regained the wind in the first overtime period and started with a flurry. Neither team had the energy for consistent end-to-end play. Omar Holness replaced a spent Brenden Aaronson in the 100th minute. In the 105th + 1st minute, a melee in front of Bethlehem’s box saw McGuire rush to the far post and push a shot up onto the bar only to have the rebound driven home into the empty net by former Bethlehem stalwart Hugh Roberts. After play resumed, in the 108th Roberts took Moar down from behind as they fell together into the box. After understandable fireworks of emotion on both sides, the ball was placed on the 18’s paint, Pittsburgh’s wall was paced back, and Chambers powered the ball off the near post to tie the score in the 109th. In the 112th, captains Forbes and Chambers had to be separated as they made it clear they would not be exchanging Christmas cards. ‘Hounds keeper Lynd had to rescue a breakaway in the 117th. And in the 119th Pittsburgh sub Joe Holland desperately slid towards his own mis-touched breakaway, putting his cleats studs up into Jake McGuire’s face, suffering a red card. On to penalty kicks. Bethlehem went first and made eight straight. Pittsburgh’s Ray Lee — the artist formerly known as Raymond Lee — atoned for his time on the Union by pushing Pittsburgh’s eighth kick wide of the left post, and the Steel’s rain-soaked players, technical staff, and fans went nuts. The Steel next play in the conference semi-finals against Louisville next Saturday, October 27, at 7:30 p.m.
Six: Bethlehem started that many teenagers. The most basic goal was to avoid being intimidated by Pittsburgh’s physicality and athleticism. Matt Real’s strong play caused ‘Hounds speedster Christiano Francois to switch sides of the field. 31 years old: The Steel’s captain James Chambers illustrated perfectly why a youth-development side needs the right older veteran leader. He buried the free kick that sent the match to penalties. He buried the first penalty setting the tone. He controlled the central midfield particularly in the second half. He used Irish guile to play mind games with Pittsburgh’s captain, keeping the referee’s focus on him and gaining leeway for his younger teammates. Another first: Bethlehem head coach Brendan Burke defeated USL Hall of Fame coach Bob Lilley for the first time in his tenure with Bethlehem. Bethlehem: Jake McGuire*; Olivier Mbaizo*, Matt Mahoney, Ben Ofeimu**, Matt Real*; James Chambers ©, Anthony Fontana* (Drew Skundrich 62’); Michee Ngalina, Brenden Aaronson* (Omar Holness 100’), Santi Moar; Faris (Chris Nanco 55’). Unused Substitutes: Tomas Romero**; Brandon Aubrey, A.J. Paterson, Aidan Apodaca. * – first-team player, ** = academy player. Pittsburgh: Dan Lynd; Mouhamed Dabo, Joseph Greenspan, Tomas Vancaeyezeele; Hugh Roberts, Jordan Dover (Kevin Kerr 118’), Kenardo Forbes, Ben Zemanski (Ray Lee 106’), Christiano Francois; Neco Brett (Kay Banjo 106’), Romeo Parkes (Joe Holland 96’). Unused Substitutes: Mike Kirk; Tobi Adewole, Todd Pratzner. what have the Irish had to learn during their centuries living under English overlords, from the Normans forward, unless you want to start from the Vikings? This will be especially true if you ask an Irishman, I suspect! Chambers is a guy who is writing his subtle legacy at every turn and I love it. It reminds me of Brian Carroll, doing a yeoman’s job AND mentoring his team along the journey. Just so admirable. Thanks for all your hard work Tim. Great job Steel! I hope they can keep it going.